A four-year project to clean up war memorials across Surrey has begun. The project, called Respect and Remember, has been funded by a £70,000 grant from the deputy police and crime commissioner Jeff Harris. He said work would be carried out by young people on community programmes with the probation and youth services. He said they would work on gardens, walls and areas around the memorials under supervision, but would not work on the memorials unless asked. "They are not professional stonemasons or restorers so they won't be touching the memorials themselves unless asked. They're not replacing the professionals," he said. Canon Peter Bruinvels, deputy chairman of Surrey's Respect and Remember committee, said there were more than 400 memorials across the county. "Every church has one. Village halls have them [and also] main town centres and tiny little villages." He said many had been put up after World War One and many had fallen into disrepair. 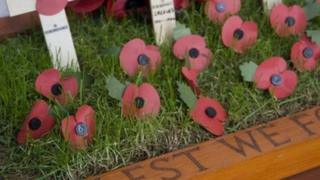 People are being urged to write to Mr Harris and recommend war memorials in need of work. All projects will be assessed and prioritised and some will be completed in time for Remembrance Day this year, he added. He said he hoped the young people involved would learn from the project and would be encouraged to research names on the memorials as well as carry out the work.